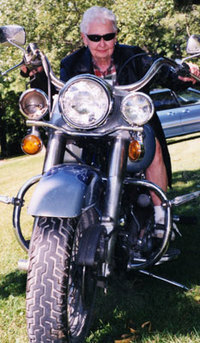 I called my Mom (the woman on the Harley to the right) last night to catch up on her latest adventures. There always is one. At 83 she may just have decided to take up a new hobby, start a business, join a hiking club or plan a trip for the whole family to Europe. She started a business at 65, started mountain hiking at 70, and decided to start traveling later yet. Dad does it, too. He chops his own wood for their wood burning stove every day, delivers meals to the “elderly”, hikes with Mom, and, in the evening studies the stock market, politics, the environment and alternative medicine with a voracious appetite for the latest in whatever he finds relevant in today’s world. Both are well past their life expectancy. Yet both are as vital, interesting and alive as they were when I was growing up – maybe more. I watch my friends struggle with their parents’ declining health and faltering memories and I know that I am blessed with good genes. But I truly believe that I am more blessed to have parents who are constantly - daily - reinventing themselves to adapt to their changing physical abilities, circle of friends and evolving interests. I’ve heard people say that people live just too long today. ‘We weren’t meant to live past 50 – that’s why we’re confused about what we’re suppose to do in the second half of our lives. Marriages can’t survive a full lifetime because you can’t help but become bored when you’re living that many years with another person. Our bodies will naturally break down because they weren’t designed to carry us through 80 or 90 or even 100 years.’ Baloney! We EXPECT to get old, tired, broken down and bored. We give up. We stop looking for new interests because we think it’s too late to start something new. We sit and wait to die. Well, not my parents! They’re having more fun now than they had thirty years ago. They’re discovering new things about themselves and about each other. Their long time friends die, but they find new ones. They accept change as part of life and keep moving on to the next adventure. They share their frustrations over brittle bones and loss of hearing. Then they laugh it off and move on. Fortunately she didn’t lose her license, but eventually she will. I worry about their lifestyle changing, but not because I think they will get old and give up on life – only because they will have to give up some of the activities they love. But I know my parents. They will simply find more things, closer to home, to enjoy – and live the good life until it’s over. Why Are We So Hard On Our Bodies? It's hard to walk past a mirror and not look at yourself. Even men stop and gawk at themselves. And not many of us like what we see when we look at our reflection (read: are my thighs REALLY that big??). The good news comes in the form of a study authored by Dr. Sherrie Delinsky of Massachusetts General Hospital. In a story by Reuters, the study found that a therapy known as "mirror exposure" eased some of the negative thoughts and behaviors of women with body image problems serious enough to put them at risk of developing an eating disorder. The goal is to help women let go of their constant self-criticism and learn how to better respond to distressing thoughts about their bodies, according to Delinsky. So instead of looking at yourself and saying "MY THIGHS ARE HUGE," we might note instead that we see a difference in the proportions of the top of your legs in comparison to your arms, and those proportions might not at all be that negative. When you describe yourself objectively - somehow your thighs seem to shrink before your very eyes. Parts are just parts, not a reflection of you. We all value our friendships – especially those who have seen us through different stages of our lives, sustaining us through the changes we go through, while staying constant in their devotion. But what do those friendships actually DO for us? Is there value beyond the warm, fuzzy feeling from seeing those same familiar faces that look at us knowingly every time we succeed, fail, do something stupid, or just royally screw up? According to studies, people who have close contact with friends live longer, healthier lives. In fact, people with extensive social ties live an average of 2.5 years longer than people who live isolated lives. Women especially, gain valuable benefits from their close friendships. While men are hard-wired to respond to stress with the “fight or flight” behavior necessary when they were cavemen, women are more likely to “tend and befriend”, an act that releases the calming hormone, oxytocin. The results of one study concluded that not having a close friend or confidante was as harmful to a woman’s health as smoking or being overweight. And you don’t have astronomical monthly insurance premiums or expensive pharmaceuticals with this foolproof preventative. So why do so many of us put so little effort into something that not only makes us happy, but healthy as well? Sandy and Geralynn and I plan a girls’ shopping weekend every year, which inevitably gets put off and put off until it actually only happens every third year. Jan and I plan to meet somewhere to discuss philosophy, religion and our children’s lives only once every few years. Sue and I continually promise ourselves a trip somewhere warm, a trip that has so far never materialized. There is always something that takes precedence – business commitments, family responsibilities, financial burdens. Friendship is the first thing to be tabled for later when the stresses of life have us frazzled. Yet these relationships are the tonics we need to stay healthy. And when we ignore them, it’s the same as forgetting to take our blood pressure medication or our anti-anxiety drugs. We’ve been told all of our lives that gossip with girlfriends is a silly waste of time. But it’s actually extending our lives, providing comfort during times of stress and giving us a sense of joy that only friendship with other women can provide. For Heaven’s sake ladies – make time for your friends! It’s important to your health. Dance. It’s an art form. It’s self-expression. It’s exercise. And it’s available to everyone. I told you about my friends Lynne and Sue – both beautiful, energetic 50+ women, and both dancers. Both started taking Salsa lessons from the Latino dance teacher, Johnny Salsa (I’m not sure if anyone knows his real name). Lynne soon switched to Swing, Tango and Merengue. Sue took Salsa seriously, attending dance classes twice weekly and seeking out Salsa clubs throughout the U.S. Both tell me that their self-image changes completely on the dance floor. No longer 50+ dealing with hot flashes and flapping triceps, they become veritable princesses – gliding, dipping, showing off their sexuality in dresses one could only get away with wearing on the dance floor. They’re hot. Because of their confidence they’re in demand by male dancers young and old. And they are both trim and toned, with a fluidity of movement neither had pre-Salsa. If you don’t think it’s real exercise, watch the routine. It’s some of the best physical conditioning you can get without killing yourself at the gym. I recently heard a caller to a radio talk show about dance explain, “I won’t tell you my age – I’m way up there. But when I’m on the dance floor, the music, the lights and the other dancers keep me pumped up and dancing hard for 2-1/2 hours." Now who works out that long? It takes precise body movements and deep concentration. The New England Journal of Medicine recently reported on a study that showed structured dances – like Salsa and Tango –are the only physical activities that help prevent dementia. Because it’s more than physical. It requires the kind of mental discipline most of us give up for a few more hours of TV viewing - which, incidentally does nothing to prevent Alzheimer’s, and depending on what you’re watching, probably promotes it. People have been dancing since they gathered in caves to celebrate the kill brought home by the hunters in the group. Yet dance appears to be the latest greatest discovery for improving physical and mental health. Cavewomen did it, our mothers did it – we can do it, too! Our Well Past 50 site is still under construction, but I want to share a link where we have a video posted of my L.E.D procedure and glycolic peel. If only there was a way to lose weight by simply lying down and resting your eyes while a machine took care of slimming your abs, toning your skin and ridding your body of all the nasty toxins you’ve been breathing, drinking and eating that are destroying your body. Now I know what you’re going to think when I tell you about this new treatment for all the things I mentioned above, plus arthritis, back pain and poor posture. You’re going to think that I would be a perfect candidate for a bottle of snake oil. But I urge you to keep an open mind...I thought the same thing until I lost an inch and a half around my waist just lying on a table chatting with the Ionislim lady and my camera crew! Well, I was actually lying on a table with clay smeared on a gauze sheet which was placed over my abdomen with attached electrodes pulsating as my abs flexed and relaxed every three seconds, causing me to gasp slightly between words. This is a procedure new to the U.S., though the French (we’re always finding out these little secrets as to why the French are so beautiful) have been using it since 1979. While Ionithermie was developed to treat arthritis, and some users have reported very beneficial results with arthritis, fybromyalgia and sleep disorders, regulations from the FDA prevent the company from making those claims. However, their brochure focuses on the reduction of cellulite and improvement of skin and muscle tone. I read about several people who had seen dramatic results from the treatments and couldn’t wait to try it. Christa Feist, who is an RN, discovered the treatment on a cruise. She decided to skip the port tours and sign up for the Ionithermie four-treatment package. Christa testifies she had lost 15 1 /2 inches in four treatments, dropping from a size 10 to a 4 – had firmer muscles, toned skin, and no evidence of cellulite-that’s right, just by lying there flexing a bit. She came home and called the Ionithermie people in Texas, spent 30 hours training, got her own machine, and started giving treatments in her home. Word spread and Christa soon moved into shared space in a salon. Within a year she had acquired so many clients she opened her own 2000 sq. ft studio. While I am laying there firming, toning and losing inches, Christa explained that I was being detoxified and re-mineralized as well while the Galvanic and Faradic stimuli propelled the active ingredients into my skin. Whatever it did I felt energized and thinner when I stood up from the table. Christa re-measured me to compare with my pre-treatment measurements. I measured an inch and a half smaller around the waist and an inch smaller around each thigh. Even the camera crew confirmed that my waist looked noticeably smaller (video coming soon). The treatment impressed me enough that I intend to try the 4-treatment package and see if it helps me get that cut waistline I’ve always wanted and/or helps with my arthritis pain. I had always wanted to explore Colorado, so I located a health spa and inn in Ft.
Collins to begin my journey. The Atrium is a small, funky inn smack dab in the middle of a residential neighborhood. The actual atrium has a ‘70s feel to it – funky and a little old, with a goldfish pond, a large whirlpool and Enya music piped into the large open space. The feel of it was just right for a ‘70s chick like myself. I settled in to my room – old and slightly worn, but very comfortable. Innkeeper Donna suggested we do an analysis of my health concerns in order to design a treatment program around my needs. What she suspected my main problem to be was – you guessed it – stress. She scheduled a hot stone massage for me that night to de-stress me before bed. It was wonderful. I felt like Jello. But I wasn’t finished for the evening. She set me on a bench in the Infra-red sauna for 25 minutes and insisted I drink a cup of liquid minerals before bed. I slept for 10 hours. The next morning Donna gave me an Ion Cleanse, submersing my feet in a tub of warm water, the Ion cleansing machine bubbling away as it rid my body of toxins. I don’t know where the toxins went, but my feet felt wonderful, and I was at the same time relaxed and energized, so something was working. After Donna fed me a breakfast of Sicilian fruit bread and yogurt, Tom, the friendly local realtor drove me around the beautiful mountains northwest of Ft. Collins, looking at properties I might buy to build the little getaway I had always dreamed of. The area was beautiful and property affordable, though I stopped myself from writing a check in my euphoric state. I went back to the Inn for yet another massage (deep tissue this time), another cup of liquid minerals, and another long night of sleep. Next morning, another Ion cleanse (my hands this time), 15 minutes on the Chi machine to oxygenize my body, and an application of the “Healthy Alternative to Liposuction” and I was good to go. I felt refreshed, positive and more in touch with myself than I had been in years. I drove South toward Nederland – a little town in the mountains where Sue and I had decided to meet and catch up on the details of her spiritual journey. Nederland was, well…interesting. We had a wonderful lunch at the Sunset Lodge Restaurant, gazing out at an amazing view of the mountains as we ate our veggie sandwich and Huevos Rancheros. It was so pleasant that we decided to check in to the tiny roadside lodge for the night to prolong the experience. Word of caution: Never try to prolong nice experiences. Experience them and move on. While we were sitting in a bar in town, sipping a glass of wine and watching the colorful locals, the temperature outside was dropping to 16 degrees and the winds were beginning to gust at a brisk 40 miles an hour. We hurried back to our tiny motel room for warmth. Alas, the room was only a few degrees warmer than the outside temp. We cranked the heat up full blast and snuggled in for a comfortable night’s sleep. By midnight we realized there was actually NO heat coming from our room heater and no one to call for help, since the office and restaurant were closed. We snuggled together in the same bed, covered with all of the available blankets in the room and Sue’s sleeping bag. We slept very little, and of course couldn’t shower in the sub-freezing temperature next morning. We went to the restaurant to explain. After complaining that we had disturbed her day off, the lodge manager snarled that the pilot lights naturally go out in the gale-force winds we had experienced. I decided I was going to stand my ground (something I don’t always do) and insist on some sort of concession on our bill. She grudgingly agreed to take $20 off our $79 hotel bill. At that point I decided to avoid further contact with her negativity, took my $20 and moved onto a more positive phase of my spiritual adventure. Our next stop was Evergreen, a delightful town with warmer temperatures and friendlier people than those we had encountered in Nederland. A very nice realtor named Dana showed me four cabins in the woods. One was exactly what I had always wanted, except for the price. But I guess you can’t expect to get your lifelong dream without paying a price for it. Sue and I still had not had much opportunity to share stories of our spiritual quests, so we ate a light meal at an excellent deli that has its own winery, then checked into The Highland Haven to enjoy the comfortable room (with plenty of glorious heat) and the peaceful sounds of the rushing creek just outside our door. We liked Evergreen so much we both decided to seriously consider purchasing real estate in the area. We sat and shared stories, giggled, and practiced the meditation exercises Sue had learned at one of her stops along the way. Once again, I slept like a baby and woke up excited to pack a lot in to my last day. We ate one of the best breakfasts I have ever had at the Country Café in Kitteredge and went for a five mile hike in Falcon Park. Mind you, we intended to take a two mile hike, but, neither of us being good with directions, we managed to get off our chosen trail and hike for a good hour longer than planned. No matter, the weather was perfect, the views spectacular and the bonds of friendship feeling stronger than they ever had before. Exhausted, yet invigorated, we parted company – Sue continuing on her remaining two weeks of travel – me heading to the airport and the return to reality. My trip lasted only four days, but it offered enough of a change from the day to day to bring my life and my goals for the future into much clearer focus. As I bask in the afterglow of a my wonderful journey, I am planning an annual return to The Atrium for some soul cleansing, and the possible purchase of the perfect cabin in the woods for regular retreats to Evergreen. When I left Evergreen, Sue she cautioned me not to get caught up in the “shoulds” of life I live by: I “should” save my money for retirement; I “should” plan my vacations with the kids, not alone; I “should” buy a place closer to my parents in case they need my help. I don’t know if I can do it – I’m pretty well programmed after 57 years. But my intention is to learn from this experience how to take more time for myself to work on my own spiritual growth. I really “should."